"We jumped at the opportunity of Brown Girl Surf knowing how vital it is to get our daughter around peers. She loves the water but swim clubs here have zero diversity so what you've provided her is priceless. We'll make every effort to be back!" "You have no idea how impactful Saskia's experience with you all was. It was very transformative for her. She felt so wonderfully supported by the community in terms of both as a beginning surfer & also in terms of her heart & spirit! I can clearly see how that positive experience has helped her in other things throughout this past year! She's really looking forward to us making the drive back up north when the weather warms up. I haven't been able to find anything like it here in L.A. You all have a great & unique program & you should be very proud of that." "Whenever I pick her up, the first words out of her mouth are, "Can I go again next Saturday?" “Before I did a Surf Sister Saturday, my only experience out in the ocean was when I was 6 years old and a wave came crashing down on me. I swallowed a lot of water and I was traumatized. I thought “I never wanna go in the ocean ever again” so I never did. I grew up in Southern California, right by the ocean, but I never felt like the beach was a space for me. I never saw myself being represented. The first time I came to Brown Girl Surf, I didn’t know if I was going to put on a wetsuit or touch the water. So all that I did for my first time was put on the wetsuit, walk into the ocean with the other surfers, and that was it. I checked in with myself if I was comfortable with trying to surf and I wasn’t ready for all that yet. No one pushed me. It’s all love and support. And you’re getting supported by people who you can identify with. You look to these people and you have similar experiences. They understand you. The support that they’re giving you is similar to the support they’d be able to give themselves. Here I am, a year later, and I now I put the wetsuit on and grab a board, and I just like catch a wave?! It’s so amazing! I get so many affirmations! The first time I came to a Surf Sister Saturday, everyone just greeted me like they knew me. I was super nervous that I showed up late and Marley was like “Hi Joi! So good to see you! We’re glad you made it!” and hugged me like I’d been coming to this beach for forever, and knew these people for forever. I very much immediately felt this sense of community by simply showing up, which I think can be a rare and special thing. 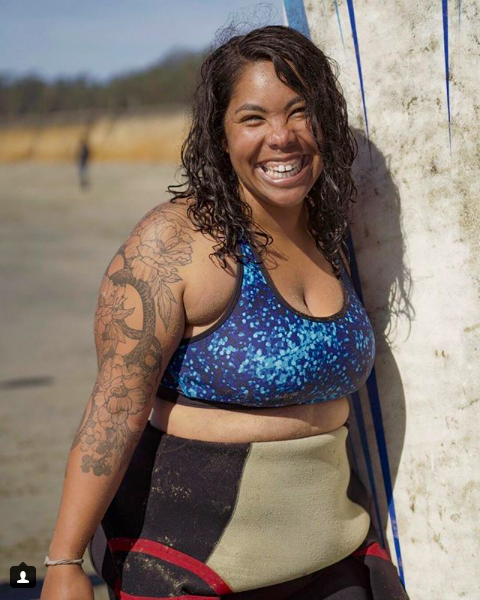 "Being a volunteer surf sister for BGS has given me a unique way to share what I love with young women of color who are so open and enthusiastic about the ocean and environment that it's humbling and soul satisfying all in one! It's such a special, positive community of badass women of all ages." “My experience as a mom inspired me to pursue the hell out of my dreams. I relentlessly pursue the things that I want to do. Passionately. To no end. Why? Because this kid is watching me. Is she gonna watch me watch TV? Watch me watch my phone? No, she’s gonna watch me make magic. If someone were to say, “I don’t know how I can get involved in surfing, I don’t have the money,” don’t worry about that. See if you have the desire first. Brown girl surf are providing you with just about everything. Transportation, the equipment, the lessons, the emotional support, and even the financial support, because there’s a sliding scale, so you can pay what you can.